You select the number of hours you would like the Handyman Service for. The Buy Now Button takes you to a Invoice screen that allows you to make any final changes as in canceling the transaction, changing the Name and Address the gift is for etc. When you use this Service you must create a PayPal account for the buyer, it is not necessary for the one who gets the service. Once the Transaction is complete an E-mail will be sent to the buyer as a receipt. The PayPal balance is never used unless work is performed and you may ask for a refund at any time. Refunds are only through PayPal. How you receive the service: By purchasing hours you are recording, by transaction, through PayPal, a record of the transaction. When the Service is completed the customer will either sign a receipt that the service has been completed or by simply texting a message to 714-721-2610 with the PayPal transaction number and a quantity of hours used. A return text message will be sent verifying the completion of the transaction. The date is automatic. Next on completion of the service if possible a E-mail will be sent to the customer verifying the completion with a Thank You. If a text message can not be used, some other form of written or electronic form will be permitted. If at any time the Service can not be completed or a customer has requested a refund a credit will be processed through PayPal to their Account. Minimums: A minimum of 1/2 HR will be charged for a visit to perform work. If the work can not be performed that hour of the visit the 1/2 hr. fee will be deducted from the Gift Certificate otherwise the hour starts on arrival. Unused hours may be refunded through PayPal. Photographs of the visit and before and after job pictures will be used for proof. This is perfect for the elderly and those who do not have access to a computer like those parents who need some work done and no cash, you help them in this way. Also you can help those in need and keep your self from being known as the provider. A great way to give back to the community. 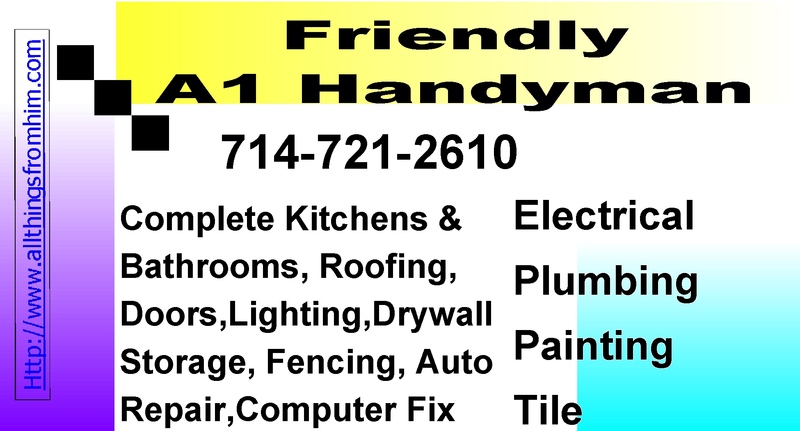 Thank You for your interest in A1 Handyman Services, Based in Santa Ana, CA. This service is only available to Orange County Residents and Businesses at the present. This Company has been in business since 1985 at different levels full and part time and has a customer base of over 230 happy customers in the Huntington Beach, Newport Beach, Costa Mesa, Fountain Valley, Santa Ana and Irvine area. References available. Services: Small Appliance Repair, Carpentry, Concrete, Painting - Int/Ext, Plumbing all types, Electrical all types, Roofing, Doors and Windows, Complete Kitchens and Bath or Repair/Upgrade, Tile, Hardwood flooring, Drywall Repair, Moldings, Electric Car stations, Solar panels, Sprinkler Systems, Car Repair/Maintenance, Lighting, Fencing, Landscaping, Block Walls and extensions, Patio fixtures, Roof venting (whirlybirds), Ceiling Fans, Computer setup and upgrade/repair, Closet or Garage storage or Storage buildings, Auto detail wash and wax, Pickup and Delivery, AirPort Service (up to 6 Passengers) and many many more, just ask? Some work may require a City Permit. Let us know how you are doing and if we can help you in any way. God Bless You! E-mail me by using the Icon on the home page. Automotive repairs include: oil changes: Engine, transmission and brakes, Alternator, Timing belt, Water pumps, Superchargers, Electrical Tune-ups, Water flush and radiator, hoses, vacuum, Air conditioning repairs, Brakes, headliners, electric windows, Upholstery, Detailing, Alignment, Tires, Washing and vacuuming, wipers, lights, custom add-ons, Batteries, Suspension parts: Shocks, bushings, steering arms and power steering pumps plus many more.